The centerpiece of Vajiko Chachkhiani's second solo exhibition at the gallery is his new, and thus far most ambitious film, Winter which was not there which can be seen as a metaphor for the liberation of an individual from his or her own history. In the film, a man watches a monumental concrete sculpture of a man being hoisted out of the sea. The sculpture is clearly reminiscent of a classic heroic monument but in a strange, and somewhat uncanny way, the face and figure of the sculpture look amazingly like the man who's watching it rise out of the sea. A strange narrative ensues eliciting questions typically raised by Chachkhiani’s work. How can we understand and describe the relationship between historical and political circumstances and their effect upon the psychological development of an individual? How do the public and the private sphere interfere with and influence our consciousness? What do we mean when we say “I"? For the installation, But Ah my foes and oh my friends, candles are collected from Georgian provincial cafes where people spend their time, leave each other, quarrel or wait. The title of the wall installation refers to the famous poem First Fig by Edna Millay and it is no accident that the candles burn from both ends and eventually form an abstract wall sculpture. This brings to mind the abstract nature of history which impacts psychological tendencies and becomes the base of dramatic events or poetic situations among people. A group of different sized, moss covered stones are placed in the gallery forming a series of works titled You touch parts of me, I did not know before. In each stone, at 8 centimeter intervals, stone splitting tools are inserted. The tools will be hammered, one hit short of cracking the stone. The other part of the sculpture is an imaginary one. An image of a possible future object - a split interior which becomes the exterior and starts the whole process again. 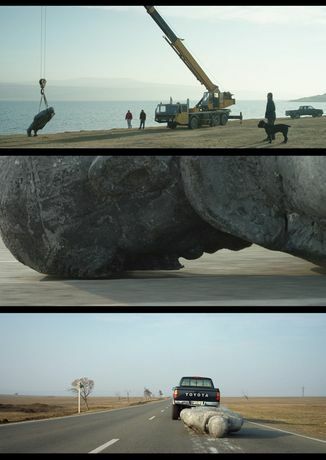 In the video, We Drive Far”, You in Front, seven ton unprocessed basalt stones fall on top of each other, at times breaking. Filmed twenty times slower than real time it constructs a dissonant scenario where an image, heavy with physicality, serves as a metaphor for the fragility of the human psyche. These raw basalt stones, fresh from the quarry, are later processed to be used in architecture. The interiors and exteriors adorned by these stones will be inhabited by families and individuals, where human unprocessed and processed dramas will take place. Vajiko Chachkhiani (born 1985 in Tbilisi, Georgia) lives and works in Berlin. Solo exhibitions include: Georgian Pavilion at the 57th Venice Biennale (2017), 15th Istanbul Biennial (2017), Museum für Gegenwartskunst, Siegen, Germany (2014), State Museum of Literature, Tbilisi, Georgia (2013). Group exhibitions include: Hamburger Kunsthalle, Hamburg (2017), Carré d’Art–Musée d’art contemporain, Nîmes (2017), Bundeskunsthalle, Bonn (2015), Museum of Contemporary Art, Wolfsburg (2014).